Influence and inspiration is drawn from the works of Neolithic inhabitants of ancient Orkney. During the long bright summer days, the light on the landscapes inspires new designs, while the long dark nights of winter is the time when he is most productive in his workshop. Wood is obtained from sustainable sources and is processed on site with our own sawmill, from log to finished piece. The traditions and culture of the islands are an important part of Michael’s life and his work reflects his affinity with Orkney and its heritage of craftsmanship. 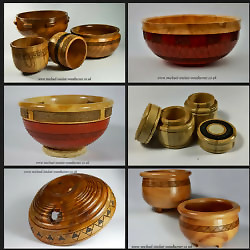 All this results in Michael creating unique, tactile pieces to enhance any home or other surroundings.